Posted by Unknown / On : 2:00 AM/ Thank you for visiting my small blog here. If you wanted to discuss or have the question around this article, please contact me e-mail at Gps_86@gmail.com. BlackBerry bold 9000 sometimes has a handsfree problem. So we can't use the earphones and sometimes the mobile shows the handsfree logo on the screen permanently. We got this error due to some settings being mismatched and sometimes due to hardware problems. Which brings us to another point to be made. If ever you can't figure out the reason for some type of disruption to service occurring, always check for hardware problems. It happens more often than you think. It could be something minor, or it could be something far more serious. 1. Go to the setting and select profile management there. Then select normal profile and with it in enhancement mode select the headset mode. 2. Now first open the mobile and change the handsfree jack and check problem. 3. 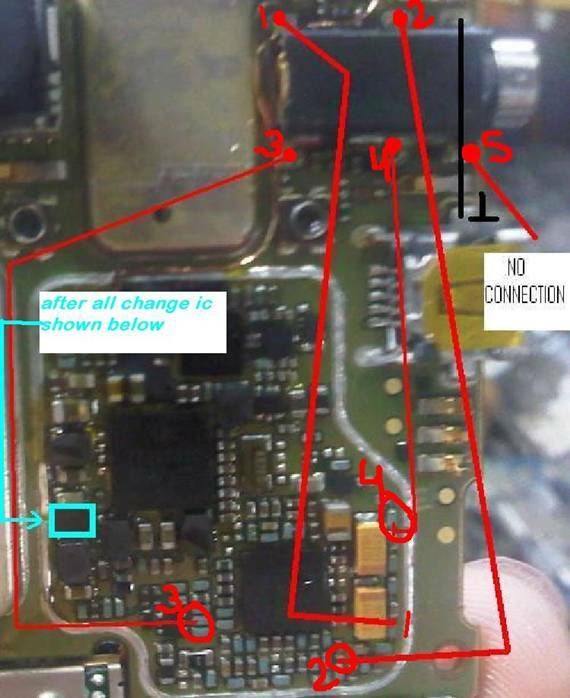 If the problem still remains after changing the handsfree jack, then we have to use the jumper for a sound IC. 5. Then connect point 2 of the handsfree jack to the transistor as shown in the image. 6. Then connect the 3rd point to the other resistance as shown in the image:7. Now connect the 4th point to another resistance properly. 8. And after all that is done connect the final and last point for a blank connection. 9. Now check the problem and if there is still a problem then finally change the sound IC as shown in the image with the rectangle mark. While setting the jumpers use good quality wire because low quality wire may result in a bad sound quality. Also, poor quality wire will most likely break or fray somewhere down the line and have to be replaced. Another thing, be careful to make sure that the jumper connections are firmly made, because having them disconnect suddenly will cause an instant disruption of services. There's yet another reason to make certain that the wire you use is in good condition, because the connectors on the jumper could disconnect from the wire and that would not only cut off your service, but leave a live wire exposed which is dangerous as well.